I enter every Giants season the same way: thinking they will win the Super Bowl. I realize it’s not a smart approach to set my expectations for the season at a championship, considering I root for a franchise that despite its four Super Bowl wins in the last 31 years has given its fan base a lot of regular-season disappointment. It’s also not the best idea to think an ownership group that interviewed Ben McAdoo and then named him head coach after speaking with him and then let him bench Eli Manning for Geno Smith has now put the team in proper hands moving forward. But the same way I’m dumb enough to bet on the Giants nearly every week, I’m dumb enough to think they can win the Super Bowl this season. I’m not the only one though. The Giants think they can too. If they didn’t, they wouldn’t have stuck with Manning for the foreseeable future and would have used the second overall pick in the draft on a quarterback. It’s quite possible that Giants ownership, the front office, the coaching staff, the players and myself are all dumb, but I like to think we’re not. Two years ago, the Giants were an 11-win team that should have won their only playoff game. Who knows where the franchise is right now if Odell Beckham Jr. and Sterling Shepard come down with what should have been early-touchdown catches in that awful wild-card game. The disaster that was the 2017 season likely doesn’t happen and Ben McAdoo is likely still the head coach and Jerry Reese is like still the general manager. Instead, the team is coming off a three-win season in which the both McAdoo and Reese were fired midseason, only after destroying Manning’s consecutive start streak for no reason. I realize success is fleeting in the NFL, but I have a hard time believing the Giants could be an 11-win team in 2016 and the only team to beat the Cowboys in that regular season, which they did twice, and then become a three-win team overnight. Maybe the eight wins by a touchdown or less in 2016 were a sign that the team just had some breaks go their way in a way they never did near the end of Tom Coughlin era, but winning one-possession games is the way to win in the NFL. It’s felt like two years since I watched any Giants football that has mattered. Last season was over in Week 3 when they lost to the eventual champion Eagles on a last-second field goal to fall to 0-3. Two weeks later, they were still winless, and a month after that, they were 1-8. It was the most miserable Giants season of my life and for many Giants fans lives, all culminating with the decision to bench Manning for no reason. But looking back, had McAdoo and Reese not decided to bench Manning and handle it the way they did, maybe the Giants win a few games down the stretch and they are both still in their old jobs for the 2018 season. It’s possible that the two idiots needed to make the worst decision in the history of the Giants to avoid Giants fans going through another season with them in charge. Now it’s Pat Gettleman and Pat Shurmur and I don’t know what to expect. Everything about the way the Giants have planned for this season makes you think they are a playoff team. Factor in the potential Super Bowl hangover of the Eagles, the illogical roster decisions of the Cowboys and the unknown with the Redskins and it’s very easy to see how the Giants could return to the playoffs in 2018, and quite possibly as the NFC East winner. The only thing standing in their way is their schedule. Normally, when you finish last in your division, you have a path to the playoffs paved for you the following season. Not for the 2018 Giants though. The first seven weeks of the Giants’ season are as hard as any ever with games against the Jaguars, Cowboys, Texans, Saints, Panthers, Eagles and Falcons. Throw in what is always a challenging division game against the Redskins in Week 8 and it’s an absolute gauntlet for the Giants until their bye week. I know it’s not about who you play in the NFL, but when you play them, but as of now, the Giants are going to have to be at least 3-4 in those first seven and 4-4 after Week 8 to have a chance at returning to the postseason. And they are going to have to start hot with a new head coach, a new offensive line and a defense that doesn’t have one true pass rusher on it. The more I write, the more I’m talking myself out of the previous paragraph and the Giants being a playoff team. But for now, I’m optimistic. 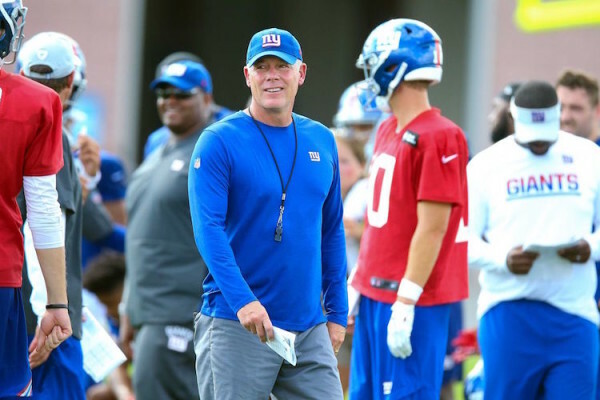 That’s right, I’m optimistic about not only the New York Football Giants, which is as ridiculous as it gets, but I’m optimistic about a Giants team that has a new head coach, a new offensive line and pass rush-less defense coming off a three-win season. I don’t know how long this optimism will last (probably until the first delay of game by the offense, or draw play on third-and-19 or holding penalty by the offensive line or first down allowed by the defense on third-and-21), but I think it will last longer than it did a year ago. It better.